Airport Express train, operated by MTR, is usually the fastest method of travel between the airport to Kowloon and Hong Kong Island. Services commenced on 6th July 1998, the opening day of the new airport and at mid-2016 the service was being used by about 43,800 passengers daily, accounting for about one-third of journeys to and from the airport. The Airport Express Line serves four stations, Asia World-Expo (an exhibition, conference and event centre, adjacent to the airport), Tsing Yi, Kowloon and Hong Kong. At the airport, the station platform is within the terminal building about 50 metres from the arrivals hall and clearly signed. Seven-car trains leave the airport daily, every 10 minutes from start of service at 05-50 until midnight and every 12 minutes from midnight to close of service at 00-48. Trains are fast, comfortable and equipped with plenty of luggage storage space. 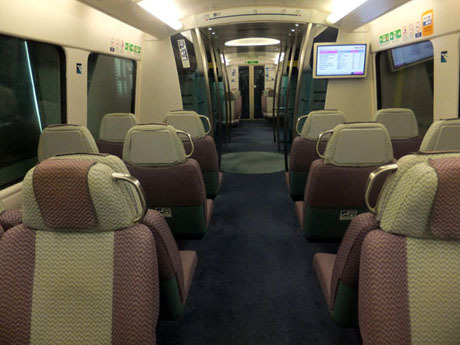 Free Wi-Fi Internet access is available (provided by PCCW-HKT) is available on all trains and power charging sockets are available in cars 1 & 7 of each train. Trains run at a 10-minute frequency from 05-50 until midnight and 12-minute frequency from midnight to close of service at 00-48. 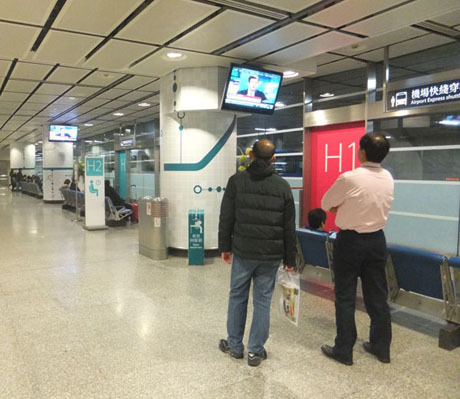 >Group Single Journey Tickets which have been used for In Town Check In services at Hong Kong Station or Kowloon Station (see below) can later be used for travel to the airport on the Airport Express either on the same day or up to one day after. 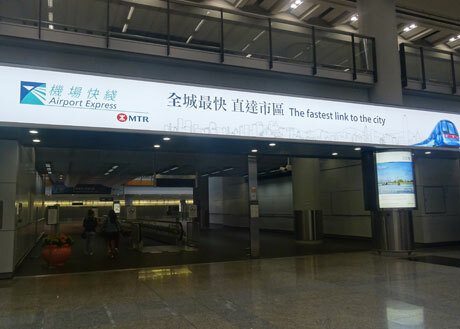 Passengers using Octopus Card to pay for travel on the Airport Express can enjoy free travel on the the whole of the MTR network (including the mainland border stations of Lo Wu and Lok Ma Chau) to or from any Airport Express Station provided all connections are made within one hour of each other. 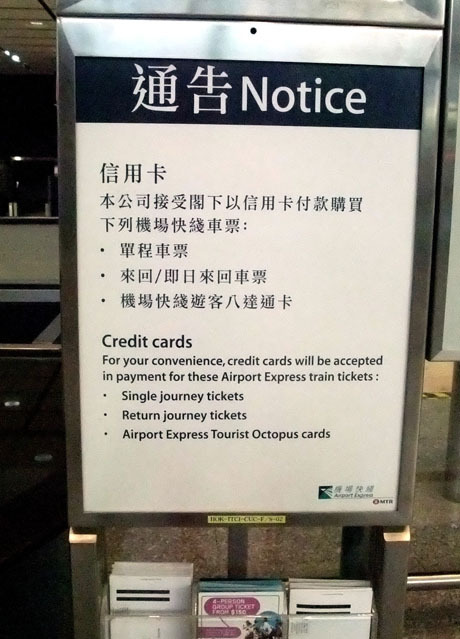 Payment can be made using Octopus Card which can be obtained from the Airport Express Customer Service Centres at the airport, MTR Ticket and Octopus Selling Machines at Airport Station or from any MTR station ticket office or customer service centre (except Racecourse, Wong Chuk Hang and Lei Tung Stations). At the airport, the Customer Service Centres can be found in the buffer halls A & B (after baggage reclaim and customs but before entering the arrival hall), also in arrival hall areas A & B and on the Airport Express departure platform (Terminal 1) and arrival platform (Terminal 2 side). MTR Ticket and Octopus Selling Machines are located near each entrance to Airport Station from the Airport Arrival Hall. 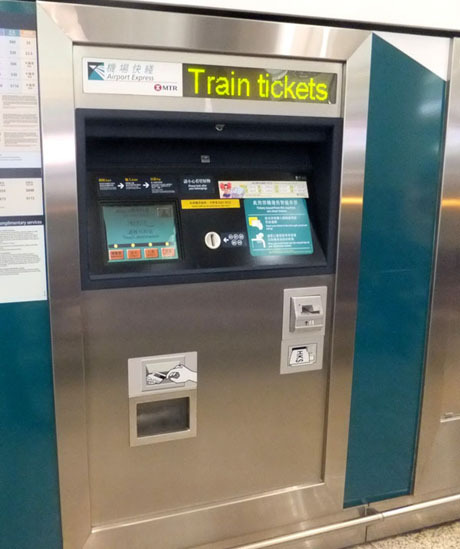 Single journey or return Airport Express tickets can be obtained either from any Airport Express Customer Service Centre or ticket-issuing machines at the airport (see above), Tsing Yi, Kowloon, Hong Kong and Asia World-Expo Stations and MTR Ticket and Octopus Selling Machines (operational from 6th September 2018) at Airport Station.. There are no entry barriers at the airport station and passengers can walk straight on to the platform and board a train. 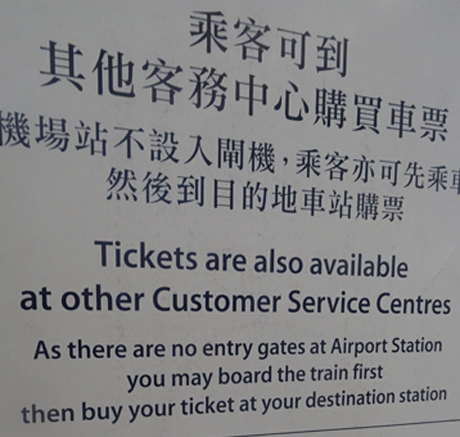 However passengers must have a valid tickets or Octopus Card to operate the exit barriers at the destination station and if not purchased at the airport tickets can also be purchased at the destination station at the Customer Service Centre in the platform area before passing through the exit barriers. Airport Express tickets and Octopus Cards can be purchased at the Airport Express Customer Service Desks which are located in area A and area B of the Arrival Hall at Terminal 1, in "buffer halls" A & B (immediately after Customs) and also on the Airport Express departure platform in Terminal 1) and can also be purchased at MTR Ticket and Octopus Selling Machines (operational from 6th September 2018) at Airport Station. 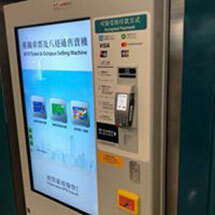 Credit cards can be used to pay for Airport Express tickets at Airport Express Customer Service Centres and at MTR Ticket and Octopus Selling Machines at Airport Station. Credit cards are also accepted for Octopus Cards purchased from MTR Ticket and Octopus Selling Machines at Airport Station. The pass is valid for 180 days from date of purchase and the Airport Express journey/s can be taken any time within that period. * The three days of unlimited MTR travel commences at the time of the first MTR (not Airport Express) journey and lasts for a period of 72 hours plus any additional hours to close of service on the final day. Unlimited travel includes all MTR lines but excludes the mainland border stations of Lo Wu and Lok Ma Chau. The pass also includes travel on MTR Light Rail and MTR bus. 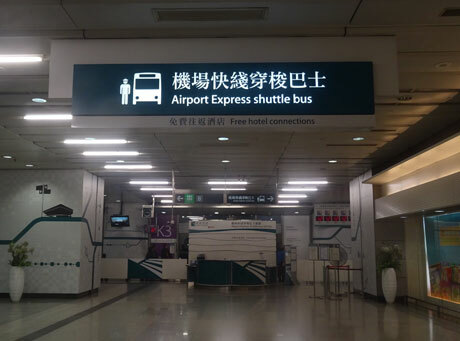 Airport Express passengers can take advantage of the free Airport Express Shuttle Bus services from Kowloon and Hong Kong Airport Express Stations to and from about 50 hotels and nearby hotels. 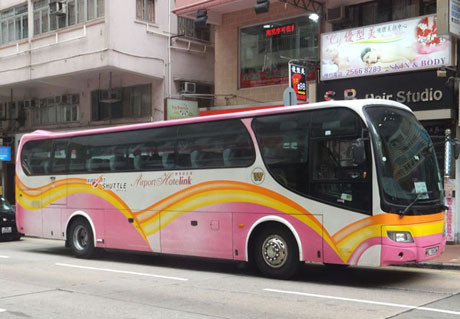 The service is operated for MTR by Tai Fung Coach Company Ltd with vehicles using MTR/Airport Express branding. The shuttle is a complimentary service exclusively for Airport Express (travelling to or from Airport Station) and High Speed Rail (Hong Kong West Kowloon Station) passengers. 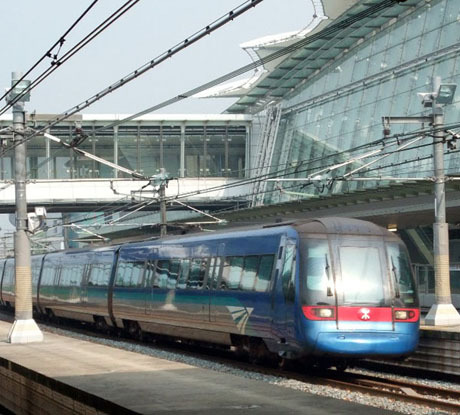 The service operates between Hong Kong or Kowloon station, major hotels and railway interchanges. H3 (To Causeway Bay) - Empire Hotel Hong Kong Causeway Bay, Metropark Hotel Causeway Bay Hong Kong, Regal Hongkong Hotel, Rosedale Hotel Hong Kong, The Park Lane Hong Kong a Pullman Hotel. K1 (To Hung Hom & Jordan) - Hong Kong West Kowloon Station, MTR Jordan Station (Austin Road), MTR Hung Hom Station, Harbour Plaza Metropolis, Whampoa Garden (Tak On Street), Harbour Grand Kowloon, Kerry Hotel Hong Kong, Eaton Hong Kong Hotel, Hong Kong West Kowloon Station. K3 (To Tsim Sha Tsui Mody Road) - Holiday Inn Golden Mile Hong Kong, Hyatt Regency Hong Kong Tsim Sha Tsui, Regal Kowloon Hotel, Hotel ICON, New World Millennium Hong Kong Hotel, InterContinental Grand Stanford Hong Kong, Kowloon Shangri-La. 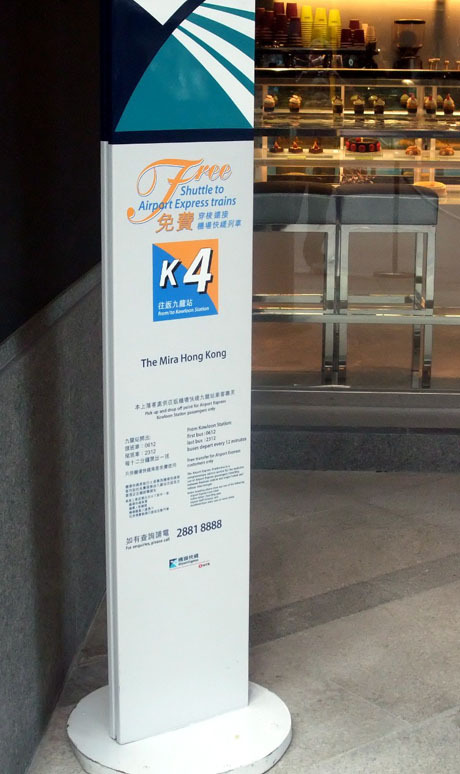 K4 (To Tsim Sha Tsui Kimberley Road) – Sheraton Hong Kong Hotel & Towers/MTR East Tsim Sha Tsui Station, Park Hotel, The Luxe Manor, Empire Hotel Kowloon Tsim Sha Tsui, BP International. 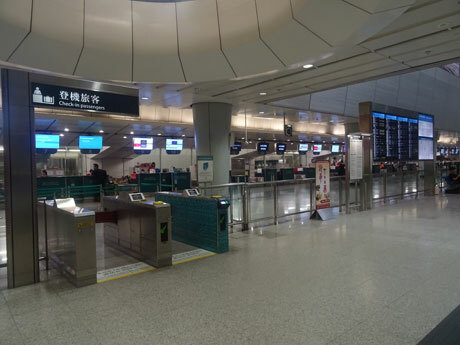 Visitors travelling with most airlines and using the Airport Express can take advantage of the free In-Town Check-In service at Hong Kong Station and Kowloon Station. This popular and convenient service is operated jointly by the MTR Corporation and the participating airlines and enables luggage to be checked in between from 24 hours and 90 minutes before flight departure time for most airlines enabling passengers with late departures to spend most of the day luggage free. Boarding passes are issued at In-Town Check-in and passengers who use this facility need not arrive at the airport until about one hour before flight departure time. The Airport Express In Town Check In Service counters are open from 05-30am to 00-30am. Either an Airport Express ticket or an Octopus Card is required to operate the barriers to access the check-in desks and Airport Express fare is paid at that time. 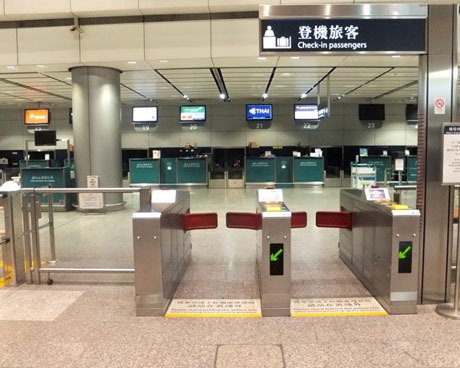 Passengers can then leave the station having checked in and on return to the station the same ticket or Octopus Card is used to open the platform barriers and the ticket or Octopus Card recognises that the fare has already been paid. However if after using the In Town Check In facility passengers subsequently choose to travel to the airport by any form of transportation other than the Airport Express no refund is given and the Airport Express fare is forfeited. 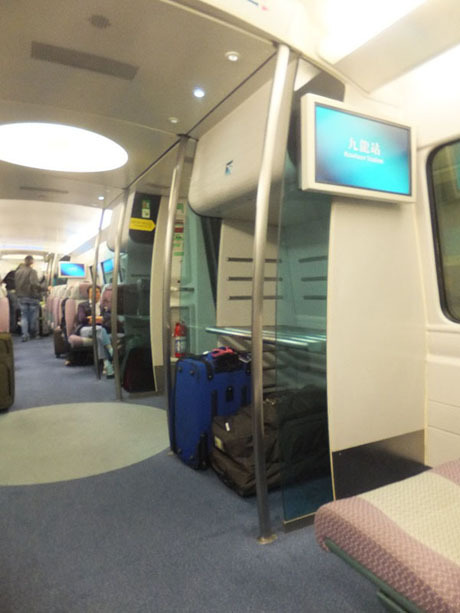 Any Airport Express ticket which is used for In Town Check In services can later be used for travel to the airport on the Airport Express either on the same day or up to one day after. Almost all areas of Hong Kong are served by frequent scheduled bus services to and from the airport Ground Transportation Centre. Buses to Hong Kong Island, Kowloon and the New Territories travel along the Lantau Link, Tsing Ma Bridge and routes A10, A11, A12 and A22 also cross the Stonecutters Bridge, opened in late 2009, and provide a scenic and interesting journey. There are clear direction signs from the Arrivals Hall to the bus terminus at the Ground Transportation Centre (about 3 minutes walk), from where the buses depart, and there is a detailed information display board detailing all routes at the entrance to the bus terminus. Information display at the entrance to the airport bus terminus gives details of bus routes and departure stands. Hong Kong Island and Kowloon are served by double deck “Cityflyer” buses and “external” buses operated by Citybus. The “Cityflyer” buses have plenty of luggage space and are equipped with visual scrolling information displays upstairs and downstairs and audible announcements detailing each bus stop on the journey and hotels and other landmarks in the vicinity in English and Chinese. There is also a recorded commentary with information about points of interest on each route, such as Lantau Island and the Tsing Ma Bridge. Luggage storage areas are covered by CCTV which can be also monitored from upstairs. Free wi-fi internet access is available on all buses on "Cityflyer" routes. Over a period of two years, the whole of the "Cityflyer" fleet is to be replaced. The first four new buses entered service in April 2013 and about half the fleet had been replaced by the end of 2013. The new buses feature reclining high-back leather seats, individual reading lights above upper deck seats and larger luggage racks. Multi-functional LCD panels will display the names of the next three bus stops and hotel names, luggage rack areas will be monitored by CCTV and all buses will be equipped with free wi-fi. 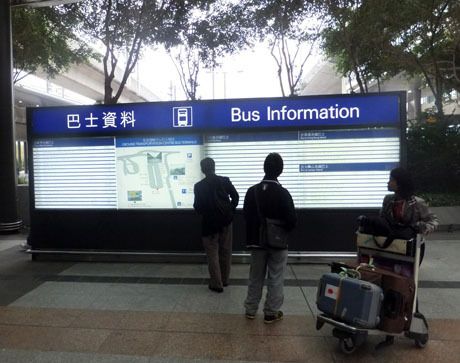 The “external” E number prefix buses have audible and visual next bus stop announcements displays and luggage space. However, these services, which are cheaper than "A" prefix routes and popular with airport workers, take a longer route via airport buildings and Tung Chung. 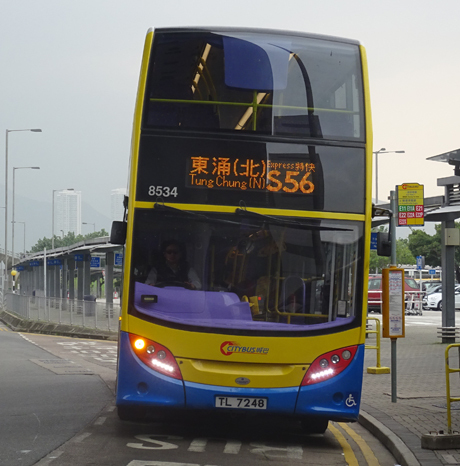 The New Territories are served by double-deck "Airbus" buses operated by Long Win Bus Company which are similar to the "Cityflyer" buses and have plenty of luggage space and next bus stop information. Tung Chung and South Lantau are served by buses jointly operated by Long Win Bus and Citybus and by New Lantao Bus Company. The most useful routes for most visitors are those detailed below which pass close to major hotels. A Citybus/New World First Bus leaflet "Hong Kong Bus Travel Guide" is available from the Citybus Customer Service Centre at the airport, also at Exchange Square Customer Service Centre and the NWFB Customer Service Centre at Admiralty Bus Station. This shows each “Cityflyer” route in detail with hotel locations and indicates which bus stop to board and alight. A11 Citybus “Cityflyer” to North Point Ferry Pier Public Transport Interchange via Lantau Link, Western Harbour Crossing, Sheung Wan, Central, Admiralty (journeys from airport only), Wan Chai, Causeway Bay and Fortress Hill. Frequency every 15-30 mins daily from 06-10 to 01-00. Fare HK$40. With effect from 24th October 2018 service route is extended from airport Terminals 1 & 2 to Hong Kong Port of the Hong Kong-Zhuhai-Macao Bridge then Airport Ground Transportation Centre for departures in airport direction from 08-30 and for departures from airport from 09-00. A20 Citybus "Cityflyer" to Hung Hom Station via Lantau Link, Mei Foo, Cheung Sha Wan, Sham Shui Po, Mong Kok, Yau Ma Tei, Jordan, Tsim Sha Tsui. Frequency every 30 mins daily from 11-00 to 24-00. Fare HK$33. A21 Citybus “Cityflyer” to Hung Hom Station via Lantau Link, Prince Edward (journeys from airport only), Mong Kok, Yau Ma Tei, Jordan and Tsim Sha Tsui. Frequency every 9-20 mins daily from 06-00 to 24-00. Fare HK$33. With effect from 24th October 2018 service route is extended from airport Terminals 1 & 2 to Hong Kong Port of the Hong Kong-Zhuhai-Macao Bridge then Airport Ground Transportation Centre for departures in airport direction from 08-30 and for departures from airport from 09-00. A22 Citybus “Cityflyer” to Lam Tin MTR Station via Lantau Link, Jordan, To Kwa Wan, Kowloon City, Kowloon East. Frequency every 12-26 mins daily from 06-00 to 00-50. Fare HK$39. With effect from 24th October 2018 service route is extended from airport Terminals 1 & 2 to Hong Kong Port of the Hong Kong-Zhuhai-Macao Bridge then Airport Ground Transportation Centre for departures in airport direction from 08-30 and for departures from airport from 09-00. A29 Citybus "Cityflyer" to Tsuen Kwan O (Po Lam Station) via Lantau Link, Lok Fu, Wong Tai Sin, Diamond Hill, Ngau Tau Kok/Telford Gardens, Kwun Tong and Hang Hau. Frequency every 30 mins daily from 08-10 to 00-10. Fare HK$42. With effect from 24th October 2018 service route is extended from airport Terminals 1 & 2 to Hong Kong Port of the Hong Kong-Zhuhai-Macao Bridge then Airport Ground Transportation Centre for departures in airport direction from 08-30 and for departures from airport from 09-00. A31 Long Win "Airbus" to Tsuen Wan (Nina Tower Bus Terminus) via Lantau Link Toll Plaza, Cheung On, Panda Hotel and Tsuen Wan Centre. Frequency every 15/20 mins daily from 06-00 to 24-00. Fare HK$18.9. With effect from 24th October 2018 service route is extended from airport Terminals 1 & 2 to Hong Kong Port of the Hong Kong-Zhuhai-Macao Bridge then Airport Ground Transportation Centre for departures in airport direction from 08-30 and for departures from airport from 09-00. A36 Long Win "Airbus" to Long Ping Railway Station (Yuen Long). From airport via Lantau Link Toll Plaza, Tai Lam Tunnel, YOHO Town, Yau San Street, Yuen Long Police Station, Shui Pin Tsuen, Yuen Long Park, Long Ping Estate. From Long Ping Railway Station via Long Ping Estate, Shui Pin Tsuen, Yuen Long Police Station, Yau San Street, Sun Yuen Long Centre, YOHO Town, Tai Lam Tunnel, Lantau Link Toll Plaza. Frequency from airport every 30 mins from 07-30 to 24-00 daily. From Long Ping Railway Station, every 30 mins from 05-15 to 22-45 daily. Fare HK$27.7, With effect from 24th October 2018 service route is extended from airport Terminals 1 & 2 to Hong Kong Port of the Hong Kong-Zhuhai-Macao Bridge then Airport Ground Transportation Centre for departures in airport direction from 08-30 and for departures from airport from 09-00. A33 Long Win "Airbus" to Tuen Mun MTR Station via Lantau Link Toll Plaza, Castle Peak Road and Hong Kong Gold Coast From airport hourly, every day, from 07-50 to 22-50 then at 24-00. From Tuen Muen MTR Station hourly, every day, from 05-30 to 22-30. Fare HK$27.7. A33X Long Win Airbus (Express Service) to Tuen Mun MTR Station via Lantau Link Toll Plaza (omits Castle Peak Road and Hong Kong Gold Coast). From airport daily, every 30 mins, from 07-35 to 23-35. From Tuen Mun MTR Station daily, every 30 mins from 05-20 to 22-50. Fare HK$27.7. With effect from 24th October 2018 service route is extended from airport Terminals 1 & 2 to Hong Kong Port of the Hong Kong-Zhuhai-Macao Bridge then Airport Ground Transportation Centre for departures in airport direction from 08-30 and for departures from airport from 09-00. A41 Long Win "Airbus" to Sha Tin (Yu Chui Court Bus Terminus), via Lantau Link Toll Plaza, Sha Tin Central Bus Terminus, Royal Plaza Hotel, Regal Riverside Hotel and City One. Frequency every 20 mins daily 06-00 to to 24-00. Fare HK$22.3. With effect from 24th October 2018 service route is extended from airport Terminals 1 & 2 to Hong Kong Port of the Hong Kong-Zhuhai-Macao Bridge then Airport Ground Transportation Centre for departures in airport direction from 08-30 and for departures from airport from 09-00. NR334 - Park Island Transport Co Ltd service to Ma Wan (Noah's Ark, Ma Wan Pier and Park Island residential development). Frequency, every 30 mins from 06-30 to 00-30. Departs from bays 27/28 in Terminal 2 coach station. Fare HK$24. E22A Citybus to Tseung Kwan O (Hong Sing Garden) via Cathay City, Tung Chung, Lantau Link Toll Plaza, Diamond Hill, Kowloon Bay, Kwun Tong and Tseung Kwan O Station. Frequency every 25/30 mins daily from 07-00 to 23-50. Fare HK$24. This service starts at AsiaWorld-Expo before calling at the airport. Night service N35 continues to operate with departures from the airport at 1-30am and 4-30am and from Mui Wo at 3-15am and 4-20am. Fare HK$21 (HK$32 on Sundays and public holidays). With effect from 24th October 2018 service route is extended from airport Terminals 1 & 2 to Hong Kong Port of the Hong Kong-Zhuhai-Macao Bridge then Airport Ground Transportation Centre. DB02R Discovery Bay Transit Services Ltd service to Discovery Bay Pier. 24-hour service at 30-min frequency from 5-30am to 1am and 60-min frequency from 1-30am to 5-30am (services from 1-30am to 5-30am operate via Discovery Bay North including Auberge hotel). Journey time about 30 mins. Fare HK$35. Bus departs from bay 28 in Terminal 2 coach station. DB02A Discovery Bay Transit Services Ltd service to Discovery Bay North including Auberge hotel. Hourly service from 7-35am to 11-35pm. Fare HK$35. Journey time about 25 mins. Bus departs from bay 28 in Terminal 2 coach station. S56 Airport to Tung Chung Station and Tung Chung Town circular service. Operated by Citybus. Express service (9 mins) from airport to Tung Chung Station. Frequency every 15/18 mins daily 06-20 to 23-30. Fare HK$3.5. Note - on this circular service journey time on the return journey from Tung Chung Station to airport is about 24 mins as bus travels via Tung Chung residential developments. 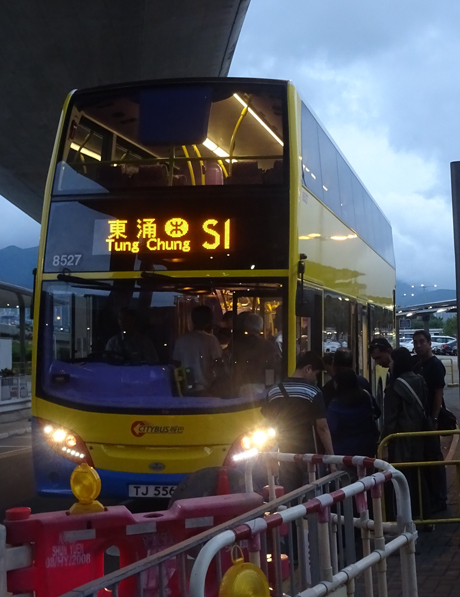 S56 Shuttle bus circular route provides an frequent express service from the airport to Tung Chung Station with a journey time of about 9 minutes. It should be noted that journey time in the opposite direction from Tung Chung Station to the airport is much longer and bus S1 provides a faster alternative. B4 - Operator - New Lantao Bus Co (1973) Ltd - Circular service Hong Kong -Macau - Zhuhai Bridge (HZMB) Hong Kong Port - HK International Airport Terminals 1 & 2 - Regal Airport Hotel - AsiaWorld-Expo - Hong Kong SkyCity Marriott Hotel - HZMB Hong Kong Port Passenger Clearance Building - HZMB Hong Kong Port. 24 hours daily at frequency of 8-15 minutes 05-30 to 00-30 and 30 minutes 00-30 to 05-30. Fare HK$7.5 (special promotional fare HK$6 applies until further notice). N11 Citybus service to/from Central (Macau Ferry Piers) via Wan Chai, Causeway Bay, Cross Harbour Tunnel, Jordan and Lantau Link. Frequency every 30 mins daily from 00-50 to 04-50. Fare HK$31 single journey. NA11 Citybus service to North Point Ferry Pier, follows same route as daytime service A11 via Western Harbour Crossing, Central, Wan Chai and Causeway Bay. One departure each way daily at 01-10 from airport and 04-50 from North Point Ferry Pier Bus Terminus. Fare HK$52 single journey. With effect from 24th October 2018 service route is extended from airport Terminals 1 & 2 to Hong Kong Port of the Hong Kong-Zhuhai-Macao Bridge then Airport Ground Transportation Centre. NA12 (from 3rd September 2018) Citybus service from Siu Sai Wan (Island Resort) via Chai Wan, Shau Kei Wan, Quarry Bay, North Point, Causeway Bay, Central, Sheung Wan, Western Harbour Crossing, Stonecutters Bridge and Lantau Link. One departure daily 04-50 from Siu Sai Wan (no service in direction from airport). Fare HK$58 single journey. 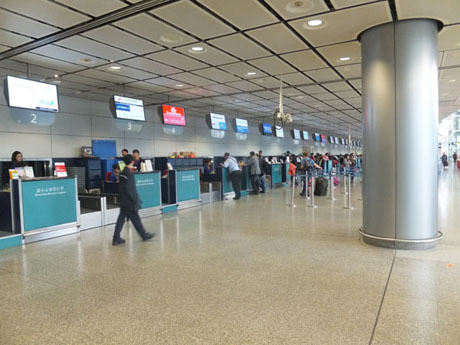 (HK$39 for eligible airport staff using "Personalised Airport Staff Octopus Card). With effect from 24th October 2018 service route is extended from airport Terminals 1 & 2 to Hong Kong Port of the Hong Kong-Zhuhai-Macao Bridge then Airport Ground Transportation Centre. NA20 (from 3rd July 2018) Citybus service to Whampoa Garden via Mei Foo, Mong Kok, Tsim Sha Tsui and Hung Hom. One departure each way daily at 00-35 from airport and 04-30 from Whampoa Garden. Fare HK$37.5 single journey. 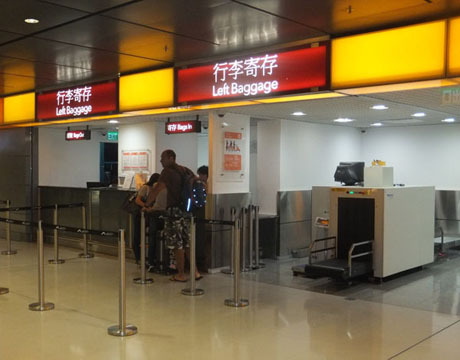 (HK$29 for eligible airport staff using "Personalised Airport Staff Octopus Card, HK$25). With effect from 24th October 2018 service route is extended from airport Terminals 1 & 2 to Hong Kong Port of the Hong Kong-Zhuhai-Macao Bridge then Airport Ground Transportation Centre. N21 Citybus service to/from Tsim Sha Tsui (Star Ferry Pier) via Jordan, Yau Ma Tei, Mong Kok, Prince Edward, Sham Shui Po and Lantau Link. Frequency every 20 mins daily from 00-20 to 05-00. Fare HK$23 single journey. NA21 Citybus service to Tai Kok Tsui (The Long Beach, Hoi Fai Road near Olympic Station) via Mong Kok (Sai Yeung Choi Street South & Mong Kok Market, Argyle Street), and Cherry Street to Hoi Fai Road. Departs Airport Ground Transportation Centre 00-45, 01-25, 02-15 and 02-45. Fare HK$37.5 (HK$29 for eligible airport staff using "Personalised Airport Staff Octopus Card). With effect from 24th October 2018 service route is extended from airport Terminals 1 & 2 to Hong Kong Port of the Hong Kong-Zhuhai-Macao Bridge then Airport Ground Transportation Centre. NA29 Citybus service to/from Tseung Kwan O (Po Lam) via Wong Tai Sin, Diamond Hill, Kowloon Bay, Kwun Tong and Hang Hau. Departs Airport Ground Transportation Centre 01-10. Departs Tseung Kwan O (Po Lam) 04-15. Fare HK52 full journey but some intermediate sectional fares available. Special fare for eligible airport staff using "Personalised Airport Staff Octopus Card, HK$35. With effect from 24th October 2018 service route is extended from airport Terminals 1 & 2 to Hong Kong Port of the Hong Kong-Zhuhai-Macao Bridge then Airport Ground Transportation Centre. N31 Long Win Bus to Tsuen Wan (Discovery Park), from airport every 30 mins from 00-30 to 05-00, from Tsuen Wan (Discovery Park) every 30 mins from 00-15 to 05-15. Fare HK$21.6. NA31 Long Win Airbus to/from Tsuen Wan (Nina Tower). To HZMB Port nightly at 04-30, 04-55 from HZMB Port at 00-45. Fare HK$33. Special fare for eligible airport staff using "Personalised Airport Staff Octopus Card HK$25. With effect from 24th October 2018 service route is extended from airport Terminals 1 & 2 to Hong Kong Port of the Hong Kong-Zhuhai-Macao Bridge which will be the new terminus for this route. NA32 Long Win Airbus to/from Kwai Chung (Kwai Chung Estate). To HZMB Port nightly at 04-15, 04-35, 04-55, from HZMB Port at 00-40, 01-15.Fare HK$33. Special fare for eligible airport staff using "Personalised Airport Staff Octopus Card HK$23. With effect from 24th October 2018 service route is extended from airport Terminals 1 & 2 to Hong Kong Port of the Hong Kong-Zhuhai-Macao Bridge which will be the new terminus for this route. NA33 Long Win Airbus to/from Tuen Mun. To HZMB Port nightly at 03-45, 04-00, 04-35, from HZMB Port at 00-25, 00-40, 00-55, 01-15, 01-40, 02-10. Fare HK$40. Special fare for eligible airport staff using "Personalised Airport Staff Octopus Card, HK$25. With effect from 24th October 2018 service route is extended from airport Terminals 1 & 2 to Hong Kong Port of the Hong Kong-Zhuhai-Macao Bridge which will be the new terminus for this route. NA34 Long Win Airbus to/from Yuen Long/Tin Shui Wai. To HZMB Port nightly at 03-40, 03-55, 04-10, 04-25, 04-45 from HZMB Port at 00-15, 00-25, 00-35, 00-50, 01-05, 01-20, 01-40, 02-05, 02-20. Fare HK$40. Special fare for eligible airport staff using "Personalised Airport Staff Octopus Card, HK$25. With effect from 24th October 2018 service route is extended from airport Terminals 1 & 2 to Hong Kong Port of the Hong Kong-Zhuhai-Macao Bridge which will be the new terminus for this route. NA40 Long Win Airbus to/ from Wu Kai Sha Station. To HZMB Port nightly at 04-10, 04-40, 04-55 from HZMB Port at 00-20, 00-40. 01-20, 01-40 Fare HK$40. Special fare for eligible airport staff using "Personalised Airport Staff Octopus Card HK$25. With effect from 24th October 2018 service route is extended from airport Terminals 1 & 2 to Hong Kong Port of the Hong Kong-Zhuhai-Macao Bridge which will be the new terminus for this route. NA41 Long Win Airbus to/from Sha Tin (Shui Chuen O). Fare HK$40. Special fare for eligible airport staff using "Personalised Airport Staff Octopus Card HK$25. With effect from 24th October 2018 service route is extended from airport Terminals 1 & 2 to Hong Kong Port of the Hong Kong-Zhuhai-Macao Bridge which will be the new terminus for this route. N42 Long Win Bus to Ma On Shan (Yiu On). Commences From Tung Chung Station at 00-20 daily via airport to Ma On Shan. Departs airport at about 00-35. From Ma On Shan at 03-50 and 04-50 daily, Fare HK$27. NA43 Long Win Airbus to/from Fanling (Luen Wo Hui). To HZMB Port nightly at 04-10, 04-30, 04-50, from HZMB Port at 00-20, 01-15. Fare HK$45. Special fare for eligible airport staff using "Personalised Airport Staff Octopus Card HK$30. With effect from 24th October 2018 service route is extended from airport Terminals 1 & 2 to Hong Kong Port of the Hong Kong-Zhuhai-Macao Bridge which will be the new terminus for this route. NA47 Long Win Airbus to/from Tai Po (Fu Heng). To HZMB Port nightly at 04-25, from HZMB Port at 00-30. Special fare for eligible airport staff using "Personalised Airport Staff Octopus Card HK$32.5. With effect from 24th October 2018 service route is extended from airport Terminals 1 & 2 to Hong Kong Port of the Hong Kong-Zhuhai-Macao Bridge which will be the new terminus for this route. On Routes A10, A11, A12, A21, A22 and A29, if return journey is made same day and payment is made using Octopus Card, 50% fare discount applies to the return journey. *Pre-paid return ticket is available on these routes for HK$65 available from airport Ground Transportation Centre and Citybus/New World First Bus Customer Service Centres. **Pre-paid return ticket is available on these routes for HK$55 available from airport Ground Transportation Centre and Citybus/New World First Bus Customer Service Centres. Fare for all airport buses can be paid with Octopus Card or exact amount in cash (by placing the fare in the fare box next to the driver) but no change is given. Tickets for "A" prefix Cityflyer and Long Win routes can also be purchased at the Citybus and Long Win Customer Service Centres at the airport bus terminus and payment for tickets can be made in cash or by credit card. AIRPORT - HOTELINK is operated by Trans-Island Limousine Services, a subsidiary of Kwoon Chung Group, and was appointed by the airport authority as the licensed operator of airport - hotel coach shuttle services on 1st July 2010. 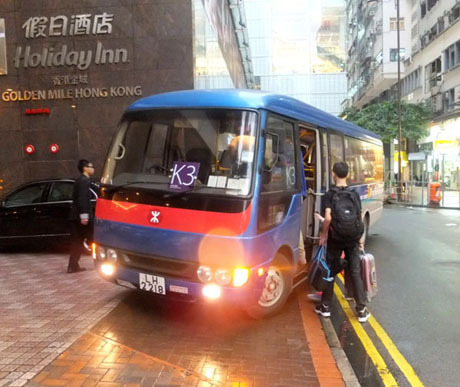 Luxury coaches serve over 100 participating hotels in Kowloon and on Hong Kong Island. One-way fares are HK$130 to hotels in Kowloon and HK$150 to hotels on Hong Kong Island. Coaches are equipped with panoramic windows and leather seats with foot rests. Coaches depart from the coach station attached to Terminal 2 (three minutes walk from Terminal 1) at the airport. In the event of coaches being full a complimentary back-up limousine service is provided. Each coach may serve several hotels according to demand. Coaches operate about every 30 minutes from the airport and at 30 - 60 minute frequency from hotel to airport. Tickets can be purchased at counter BO1 in the Arrivals Hall of the airport Terminal 1, counters CO7 & CO8 (near the coach station) in Terminal 2 or from hotel's concierge. Taxi ranks are supervised by English speaking staff and there is an information kiosk at the entrance to the taxi ranks. Taxi fares from the airport to most districts are displayed on boards and in information leaflets. 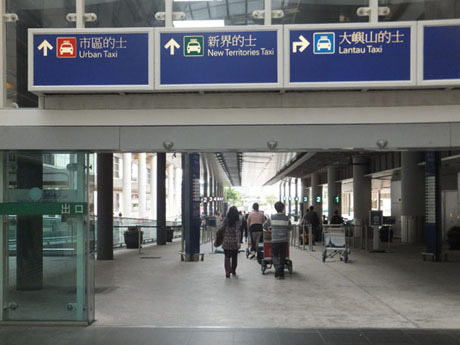 Passengers travelling in red (urban) and green (New Territories) taxis should be handed a Taxi Information Card by by the supervisor which shows date and time of boarding the taxi, taxi number and other information. Passengers should ask the taxi driver for a machine-printed fare receipt, or a hand-written fare receipt if the machine fails to operate. The fare receipt, which the taxi driver is legally obliged to provide on request, should taxi registration number, date, time, any surcharge (toll fee, baggage charge etc) and total fare. For more information on types of taxi, taxi operating areas and using taxis see separate section “TAXIS”. NOTE – Since November 2014 taxis are permitted to serve Discovery Bay North, in the vicinity of Auberge hotel and DB North Plaza only, but not other areas of Discovery Bay. Discovery Bay Pier is served by 24-hour airport bus service DB02R. Bus DB02A serves DB North Plaza direct from the airport between the hours of 07-45 to 23-45. Buses DB02R and DB02A depart from bay 28 in Terminal 2 coach station. Taxi fares include bridge and tunnel tolls but exclude luggage charge. Luggage is charged at HK$6 per large piece in the boot for all taxis. 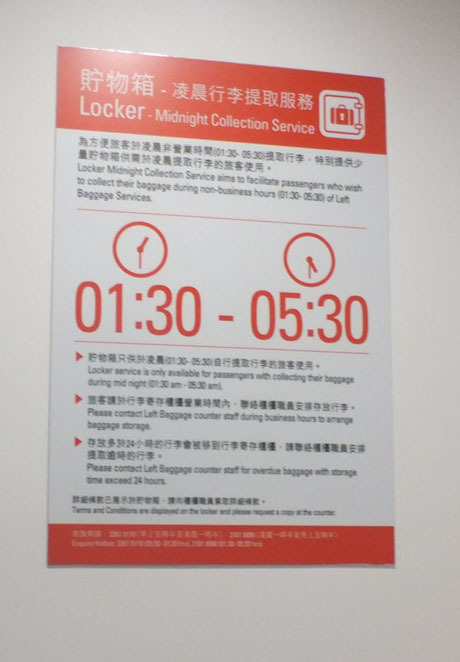 The luggage storage facility at the airport also has a "Midnight Locker Service". The lockers can used only for collection of luggage between 1-30am and 5-30am, outside the normal operating hours of the luggage storage service. Luggage can only be deposited in these lockers during normal operating hours of the service counter, 5-30am to 1-30am and must be presented at the service counter for scanning.